When my husband and I brought our new baby home, we stood inside the front door with our daughter and said to each other, “Now what?” We couldn’t just put the baby in her newly-decorated room and go about our business; we couldn’t put the baby down at the front door like we do with our keys. At that moment, our entire lives changed. Our pre-natal classes did a great job of preparing us for birth, but that only lasted for a few days. What about the rest of our lives as parents? I realize that there is no class anywhere that will teach you everything you ever needed to know about being a parent, especially not in half a dozen sessions based on pushing and breathing. For most people, things like needs-based communication and conscious parenting are a matter of trial by fire if they are addressed at all. I know that my husband and I were not alone in our experience as the door closed behind us and we stared at our baby like “deer-in-headlights,” wondering what to do next. Conscious parenting is mindful parenting. It is the willingness to rediscover the state of play with your child, to be aware of the emotional needs of your child and to be in a present state of communication with your child at all times. It is a constant work in progress, but a very satisfying relationship develops between parents and children that is worth all of the work and effort. A relationship of trust anmad honesty is developed, along with fewer struggles. As a result, we begin to re-parent ourselves, thus reciprocating the relationship and transforming ourselves as adults. Unless you choose Child Development as a major in college, chances are you are going to be winging it when the time comes for you to be a parent. By the time you realize the importance of being a conscious parent, your life gets too busy with actually being a parent to take the time to learn how to be a conscious and mindful parent. Mostly, we carry on as parents saying that we’re not going to make the same mistakes our parents made, not realizing that those habits are ingrained in our sub-conscious mind, kind of like the default settings on a computer. The subconscious mind controls 80% of the conscious mind, according to Dr. Marc Schoen, Assistant Clinical Professor in UCLA’s School of Medicine, where he teaches and conducts research on Mind-Body Medicine. It is necessary to re-train the sub-conscious mind through education and the decision to take action in order to create lasting change. According to Dr. Bruce Lipton, cellular biologist and author of ‘The Biology of Belief,’ with the current research available on the power of perception, change becomes a greater possibility. His experiments examine in great detail the molecular mechanisms by which cells process information. His research shows that our perception of our environment directly controls the activity of our cells. In other words, if our thought patterns are positive and uplifting, our cells go immediately towards growth and regeneration. On the contrary, if we consume ourselves with negative thoughts of fear and doom, our cells move into a fight-or-flight response of protection, hindering the growth process. This is an either/or situation, meaning a cell cannot be in growth and protection at the same time. So, if we change our perception of any given situation, we are literally re-programming our bodies on a cellular level. For example, if a parents continually say to their children, “Don’t go outside in the cold without a jacket or you’ll get sick,” they have not only planted the thought of getting sick in the children’s minds, but according to Lipton, the cells in their bodies immediately go into a protection response and limit their growth process, lowering their immune function. This is not to say that the child is guaranteed to get sick, however, repeating phrases such as, “You’re going to get sick,” or “You’re going to fall’” are phrases that actually carry the potential to compromise the immune system over time. Instead, parent-coach Bill Stierle, an expert in the technique of Non-Violent Communication (developed by Marshall Rosenberg) recommends that parents state their concerns and identify their emotional need for their child’s safety, health, or consideration of others. In most cases, the child will respond positively. 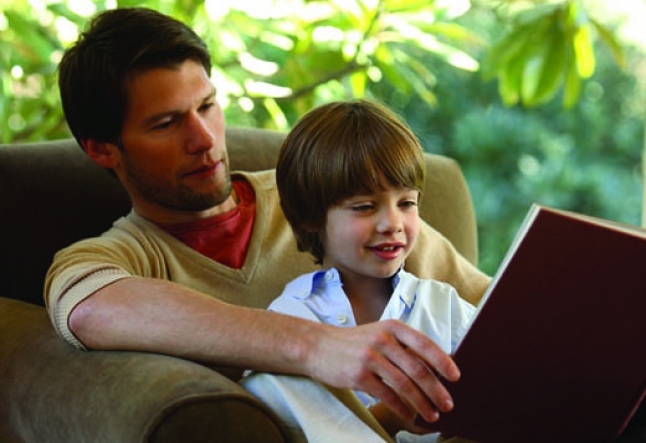 Stierle suggests that parents who take the extra time and effort to learn how to communicate effectively with their children in this way have a much greater sense of connection and harmony with their children. When practiced with intention and consistency, this is a very effective way of parenting that fosters a deep openness, allowing communication to flow easily. Another example is if a child decides to re-create the “Mona-Lisa” on the wall with a red crayon. Do you yell, “Stop!” and grab the crayon from her hand? At this point, any possibility of creating a learning experience or drawing anything positive from the situation disappears. An adversarial dynamic is created in which the parent becomes an aggressive authoritarian and the child is likely to feel confused and victimized. A more effective approach, following the technique of Non-Violent Communication would be to say to the child, “I can see you’re feeling excited to draw the wall because it meets your need for play and you really wanted to express yourself. My request is that you express yourself on this piece of paper at the table. Would you be willing to help Mommy clean the wall of the kitchen?” According to Stierle, even if the child does not help you clean the wall, your feeling of resolution is higher because your emotional needs have been expressed and your child’s need for play and creativity have not been tarnished. Of course, for those who are new to the idea, the wording may sound a bit sterile or institutional, but the point behind it all is to allow both the needs of the parent and the child to be considered in any situation. Taking the time to communicate with intention and presence circumvents the tendency for outbursts of negative emotion to erode the channels of positive communication that every parent desires. Our words can also be used as magic wands when choosing the right words to say in a time of trauma. According to hypnotherapist Judith Simon Prager in her book ‘The Worst is Over: What to Say When Every Moment Counts,’ knowing the right words to say in an emergency can relieve pain and anxiety, speed up the healing process and shorten recovery time. Judith is a consultant to Cedars-Sinai Medical Center in the Cardiothoracic Surgery Unit, and she has trained firefighters, emergency medical personnel, nurses, and pediatricians in the best language for pain and stress relief. Knowing the healing power of words is very valuable, especially when it comes to your children. When children fall or injure themselves, knowing the right words to say can take you out of a place of panic. One day, my three-year-old daughter was running around the backyard, galloping like a horse. She was playing “I’m gonna get you” with her dad when she fell and stubbed her toe. It was more than a little scrape: she peeled back the skin off the tip of her toe, and blood was dripping from the area. Of course she didn’t realize how bad it was until she saw the blood and started to cry. My husband brought her to the bathroom sink and I came running in to see the toe. I immediately said to her, "Do you see that you stubbed your toe, and that you might be feeling scared right now.” She began to cry even harder. “Would you like mommy and daddy to wash your toe, or would you like to start healing your toe yourself?” I gave her a choice which started to take her attention off the crying and moved her into a place of choice. Choice is very empowering for a child. “I want to heal it myself,” she replied. Then I told her “The worst is over and your healing has already begun,” which I remembered from Judith’s book. Her crying subsided and she helped us run her toe under the warm water and clean it. As we were doing this, I told her a story of how I fell once, and I healed very quickly from my fall. Then I asked her to tell us about all the fun things she wanted to do when her toe was healed. This is a neuro-linguistic technique called “forward-pacing.” It allowed my daughter to know that her toe would be healed very soon. Her toe healed in a matter of days, which was amazing for something that looked like it would take weeks to heal. A few days later, my husband and daughter were playing with a sock-puppet on his foot. The sock-puppet said to her, “Hi, how are you today?” Kayla proceeded to tell the sock-puppet that if he ever stubbed his toe, that it was OK to be scared. Then she told the sock-puppet he could heal it all by himself and if he put it under warm water it would feel better. So, not only did she heal her toe, but the rewarding part was that she was able to repeat the entire process to someone else, or in this case, something else. According to research, the word NO, if stated firmly by the mother or primary caregiver, triggers the fight-or-flight response in the body, again moving the cells into a place of protection. This takes the child out of a safe-place relationship with the mother and transforms it into a space of pain, which threatens the bond between mother and child. According to Pearce, this can shut down the child’s positive emotional state on which a healthy sense of exploration and learning depend, and produces a cascade of negative hormonal-neural reactions in the child. Pearce goes on to suggest that a child continues to hear negative patterns of NO! and DON’T through adolescence from authoritative figures, thus contributing to the rise in teenage violence and other negative behavioral patterns. It is this pattern that spawns the sense of rebellion so commonly associated with adolescence. How do we restore and reestablish boundaries? Many times as a result, the child will use the word “No” as a replacement for “Choice.” What a parent can say is: “I hear you want to choose to do something different from what I am asking, is that right?” The child then says yes! And the parent then has the opportunity to find out what is “behind” the No. By creating a safe space in which children can express themselves emotionally and by establishing boundaries ahead of time, the response of NO will diminish. For example, if you are at the grocery store with your toddler in the shopping cart, and she reaches for a row of mustard jars, it is better to express your need for safety and consideration rather than shouting NO! after she has reached for the jars. It would sound something like, “I see that you want to play with those pretty yellow jars, but my need for your safety is not being met. Would you be willing to play with your toy or would you like to chew on this carrot instead?” They may say No to that and then you can respond: “You really want to choose to play the way you want, is that right?” The child will start to hear you differently, as one that is in relationship with you, not controlling or policing them. This requires a great deal of work, intention and re-parenting yourself as well as your child. However, scientific studies show lasting change is possible as long as your desire to do so is present. This is acquired by learning new techniques in conscious parenting and enjoying the results of a tantrum-free life! There will always be bumps along the road. Parents are perhaps the most human of anyone on the planet and mistakes will happen every day. Sometimes you may lose your cool and abandon all of your techniques and boundaries and good advice and turn into a raving banshee. There will be days when your child may take the mustard jar and hurl it across the supermarket regardless of how mindfully and calmly you speak to her. Parenting is not an exact science, and the key to being a successful parent is not doing it perfectly. It is in responding to mistakes and moments of difficulty with kindness, compassion and presence of mind. When you are present and in the moment, you are able to respond consciously rather than reacting mindlessly. By approaching parenting in this manner, it is easy to forgive yourself for your mistakes and focus on preserving the foundation of openness and communication you have worked to establish with your children. The bottom line in conscious parenting is not about having the top ten toys of the year or keeping up with the Jones’. It’s about establishing a long-lasting relationship with your children through communication and nurturing. Buying the most popular toy or doing what all of the other kids in school are doing can be fun, but it also takes the creativity out of the process. Be the trend-setter and spend the time to find new things to do with your children. They can be simple and free, such as nature walks exploring different types of animal footprints or a game of “I spy” while sitting in traffic, instead of talking on your cell phone while your child watches a movie in the backseat. Parenting is a process of constantly learning and rediscovering your playful self. While this is a perpetual work-in-progress the interaction between you and child creates a beautiful transformation every day of your lives.